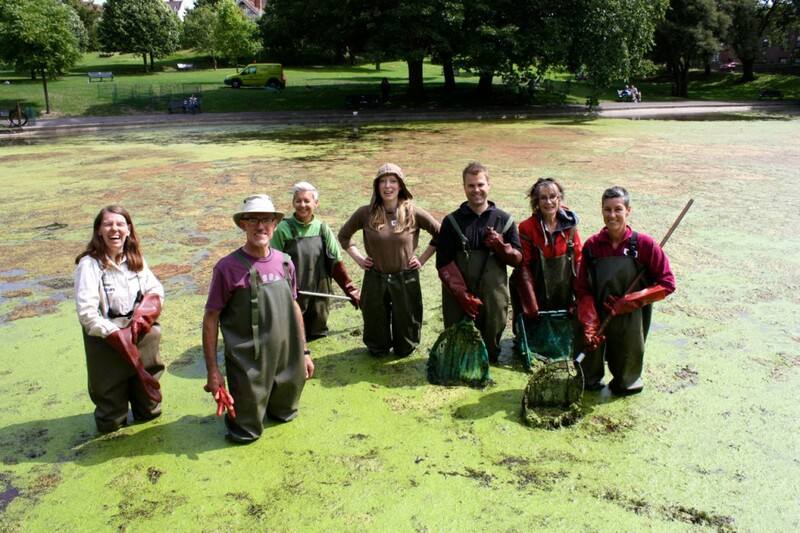 The state of the pond, an original feature of the park dating back to the Victorian era, has not escaped the Friends Of Queens Park. Chris, together with park ranger Lindsay Cattenach, were preparing to swing into action. At the end of August, they lead two terrific teams of local volunteers to address the pressing issue. They built eight large cages, to protect plants from being gobbled up by geese, and they got to grips with some of the the duck weed and blanket weed, potting 40 lilies and marginal plants in the pond. This is part of a £2,000 project jointly funded by the Friends of Queens Park and an ‘Environmental Sustainability’ grant from the council. The aim is to enable more attractive pond plants to displace duckweed and blanketweed by competing for sunlight, nutrients and pond surface area. Commercial organisations offer weed clearance and water management for lakes which as well as duckweed and algae clearance and also use water treatments to reduce nutrient levels and inhibit light penetration. But a recent estimate organised by the Friends came came to £10,000 with a further recurrent annual cost for water treatment. This kind of money is beyond the City’s current budget for parks although some elements may be possible in the future or other sources of funding found. In the meantime the future of the pond is largely in the hands of the community. “Luckily there are people out there who like a challenge,” says Chris. “They are keen to learn new skills, enjoy meeting new friends, want to do something worthwhile for an hour or two – and like cake. “Many thanks to our volunteers Sue, Jenny, Paul, Dee, Diana, Emily, Clare, Mark, Jan and Phil, plus photographer Guy Smyth of Friends Of Queens Park. 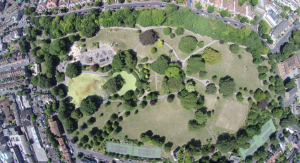 To be kept informed please send your contact details to Park Ranger Lindsay on 0781 809 2719 or Chris Lowe on 0776 1674 827 or chrisalowe@btinternet.com, or go via the Friends of Queen’s Park Facebook and Twitter sites.